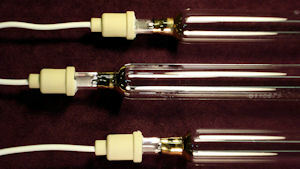 A high voltage is applied to the lamp across the electrode terminals. The voltage field ionizes the argon and produces heat to vaporize the mercury, which creates a pressure of about two atmospheres. This pressure is needed to maintain a balance between the required high intensity while maintaining the spectral output essentially in the UV region. The mercury vapor arc, which is created, exhibits the unique property of high emission of light in the ultraviolet region of the spectrum. In particular, intense emission occurs in the 240-270 nm and 350-380 nm areas, which is where typical UV photoinitiators absorb. This intense light beyond the violet region of the visible spectrum has sufficient energy to interact with photoinitiators and cause their fragmentation, which initiates polymerization. Some visible light and infrared radiation are also generated. 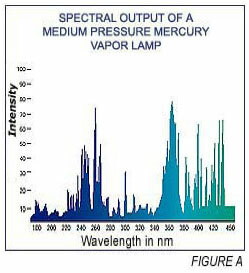 Figure A presents the spectral output of a typical medium pressure mercury vapor lamp.